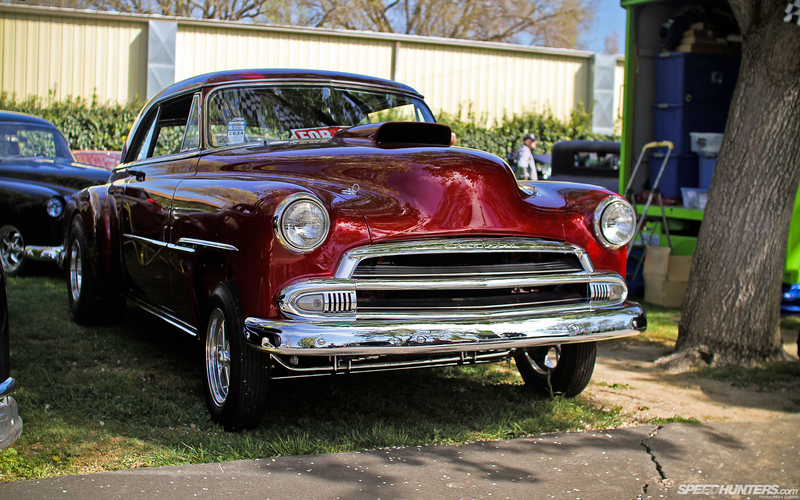 In yesterday’s post I gave you guys a broad view of the Goodguys All-American Get Together in Northern California, and today I’d like to narrow in and focus on some of the specific cars that caught my interest at the show. As I mentioned in the first post, there was huge variety of cars that came out – and I think this selection of six vehicles conveys that pretty well. 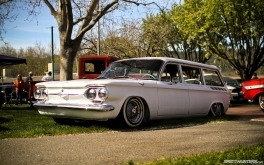 Let’s begin with one of those most unique,and also one of the coolest cars I found all day – a 1961 Chevy Corvair Lakewood wagon lowrider. 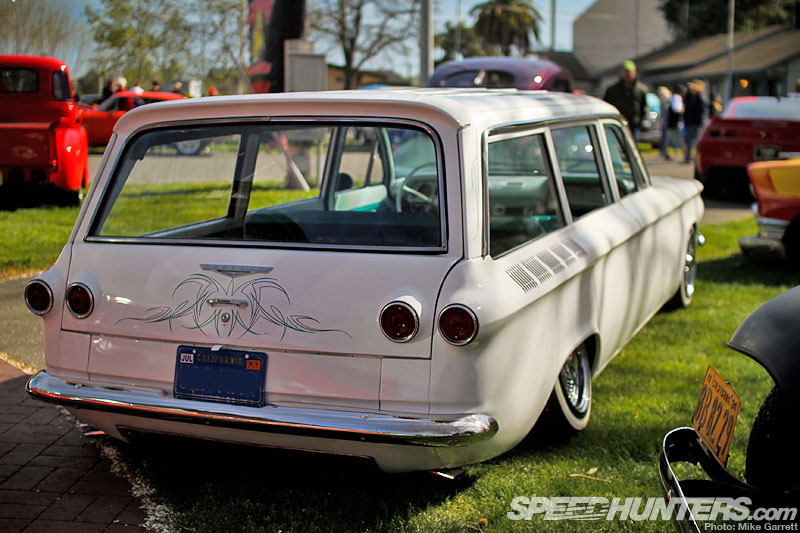 Now just seeing any Corvair wagon is quite rare in itself, but to see one dumped to the ground on wire wheels is something completely unexpected. 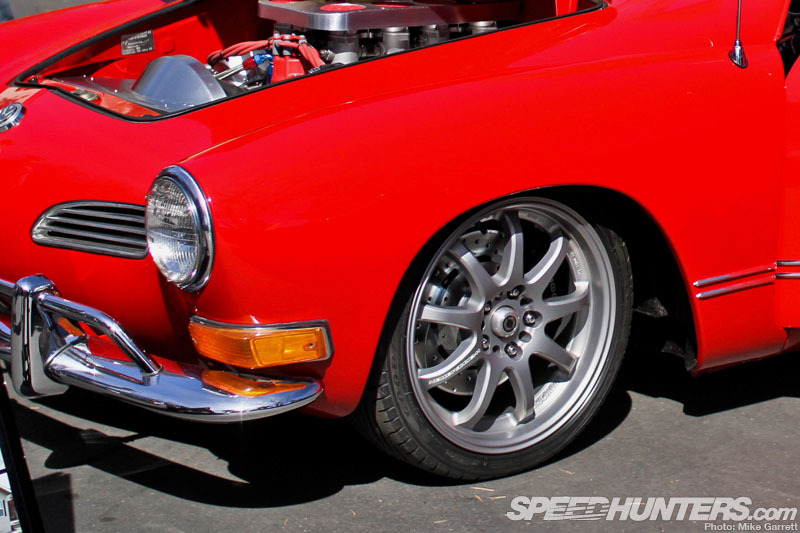 With the rear wheels cambered well into the fenders, it gives the car a slightly European or Japanese vibe. It’s fitting, considering how much different the Corvair was from any other American car of the era. Elsewhere, the car was very subtle. 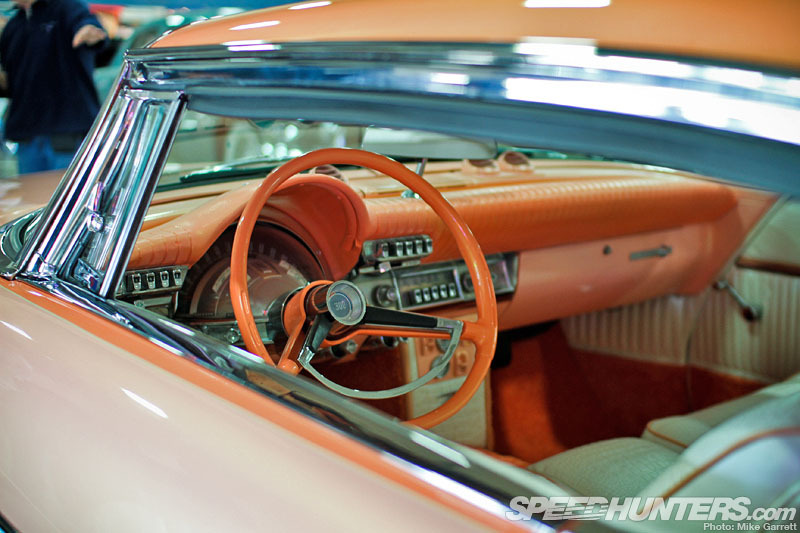 The body (with the exception of some mild shaving) and interior were largely original – and in pristine condition. It’s always great to see people think outside the box, and that is exactly what the builder of this unique cruiser did. Well done! 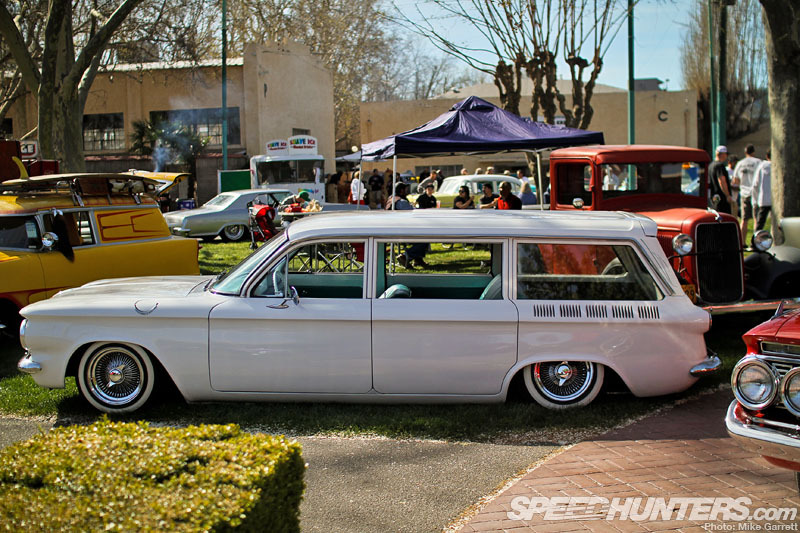 From a slammed compact wagon to a high riding bruiser. 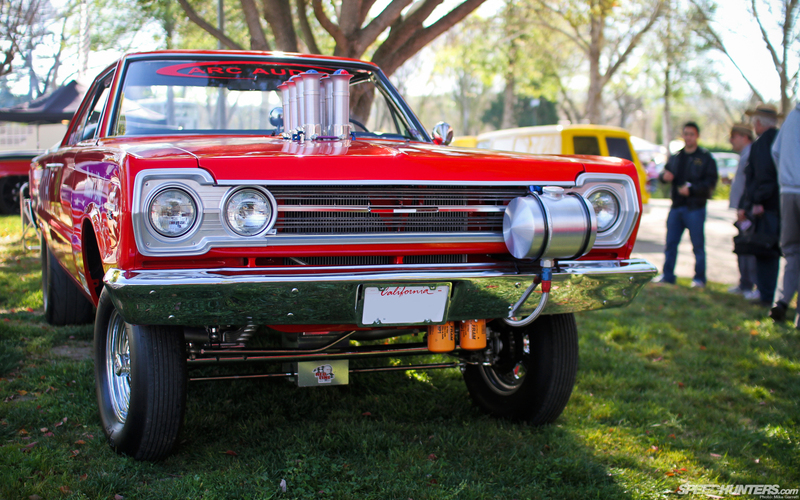 Another car that caught my eye was this badass Plymouth GTX Gasser. While ’66 and ’67 Plymouths have always been popular among racers and restorers, I can’t recall ever seeing one built quite like this. 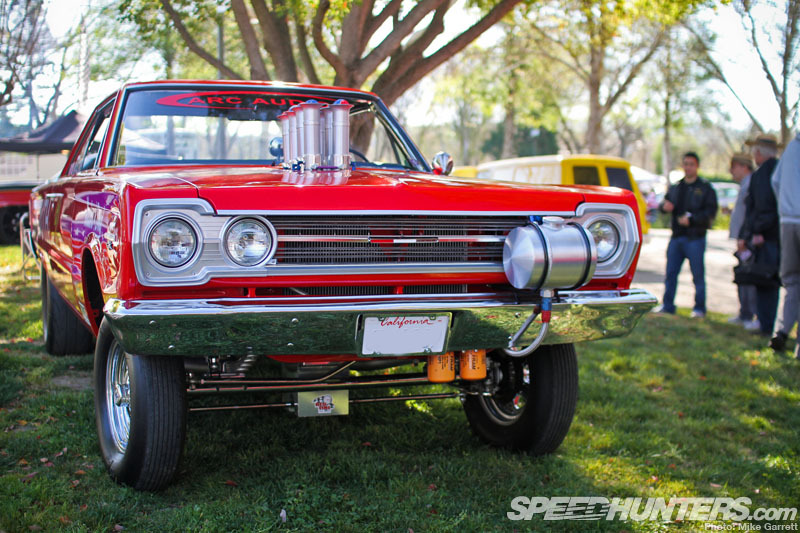 All the correct Gasser elements were checked off the list. Straight axle conversion up front with fenderwell headers, and a fitting combination of skinny Cragars up front and big steelies in the rear. 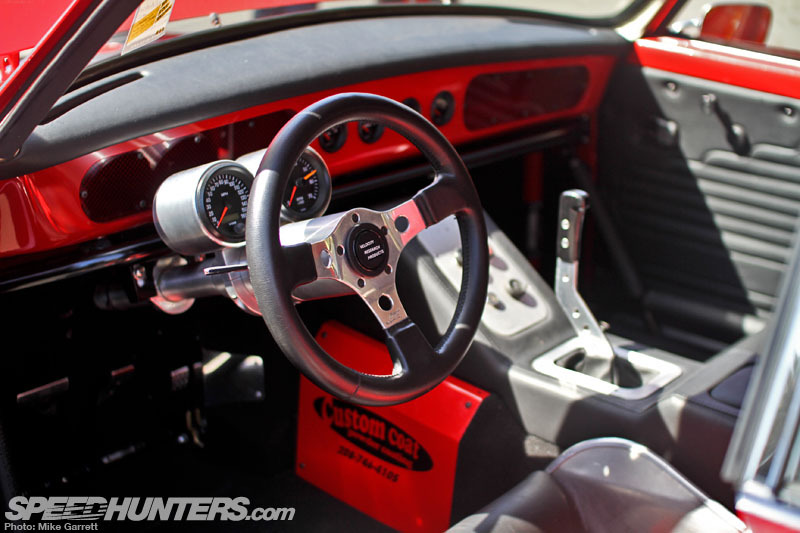 A peek inside the car reveals a cockpit that is much more street car than it is racing machine. 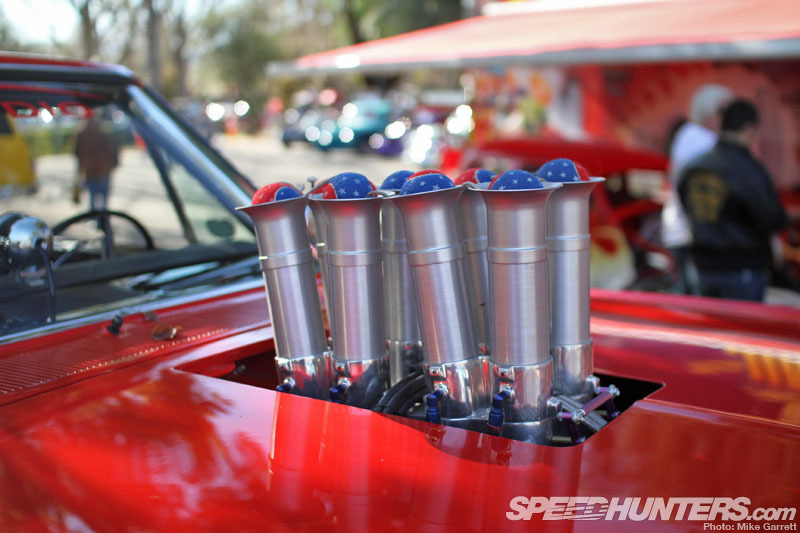 That’s just one of the many things that I love about 1960s era drag cars. If there was one negative, it was the fact that the car looked slightly out of place sitting on the grass at a car show. You can just sense this thing is waiting to be unleashed at the drag strip. 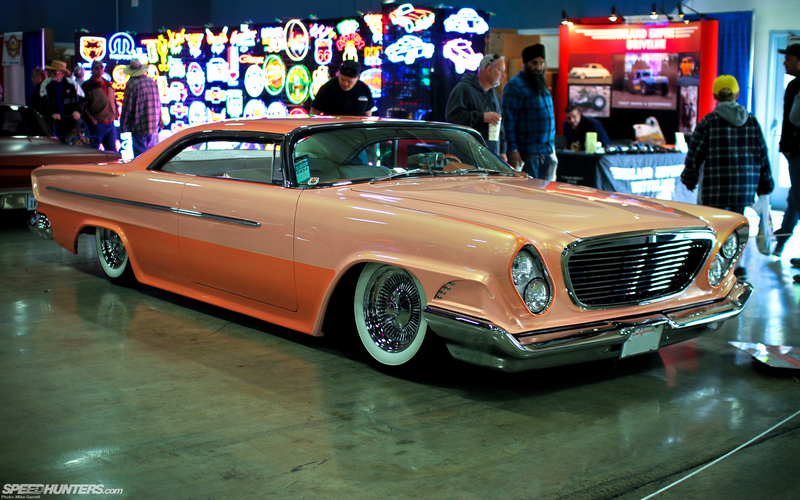 Representing the custom world, we have a stunning ’62 Chrysler 300 created by well known builder Richard Zocchi of nearby Walnut Creek. Known as “Cool 300″, this the latest in a long line of Zocchi’s custom creations. 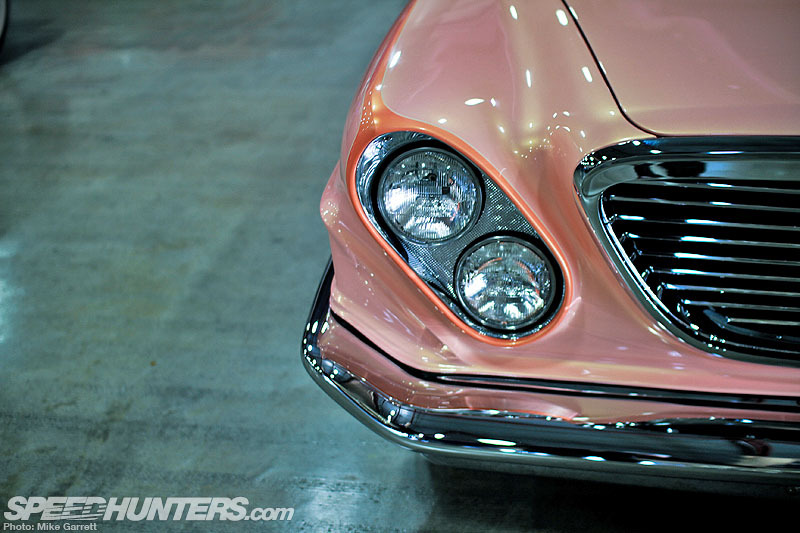 While the body of the Chrysler has been heavily massaged, the angled headlights are a factory feature that was left intact. 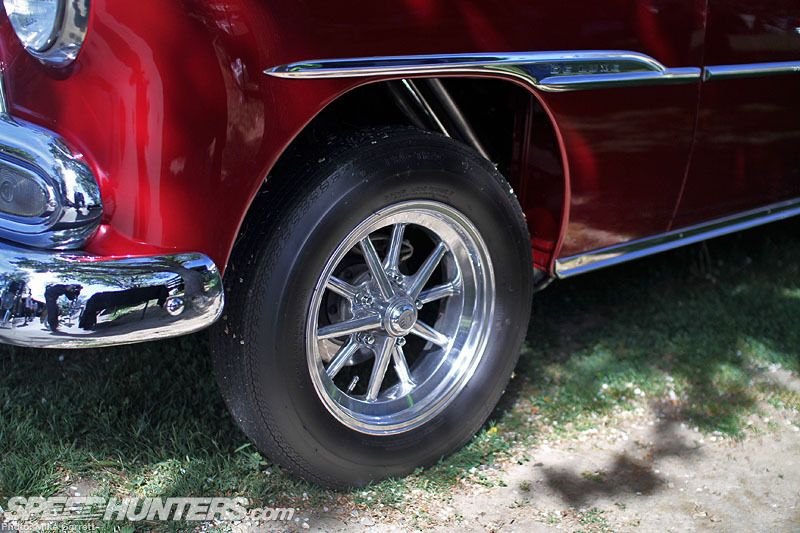 An example of some of the bold styling features seen on American cars of the early ’60s. 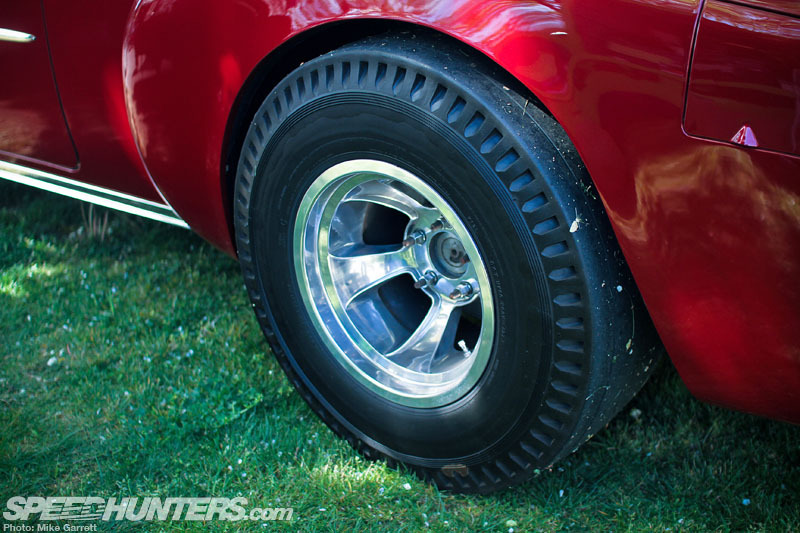 It’s hard to think of a more fitting wheel and tire combo for this car than wires with knockoffs and wide whites. It just fits with the high end custom style so well. 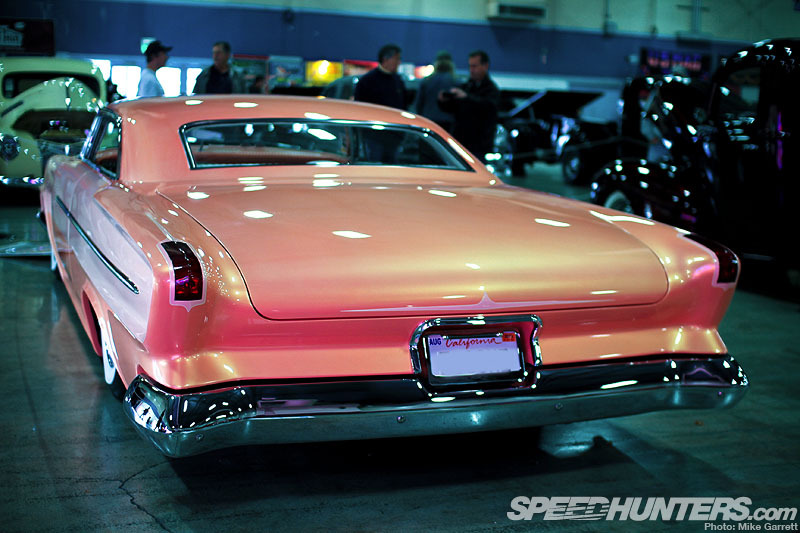 Glancing through the heavily chopped roofline, you can see an interior that’s been done in the same “sherbert” color scheme. 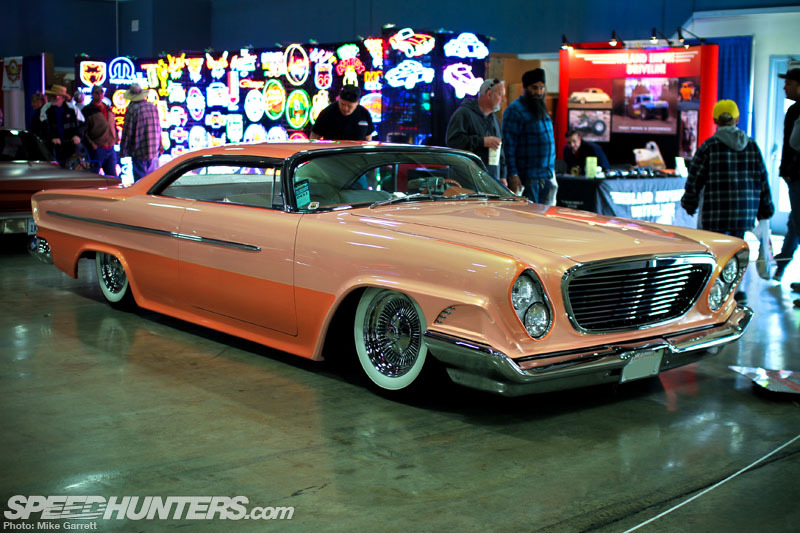 To show just how well this car has been received, it was selected as the winner of the George Barris Kustom D’Elegance Award at this year’s Grand National Roadster Show. 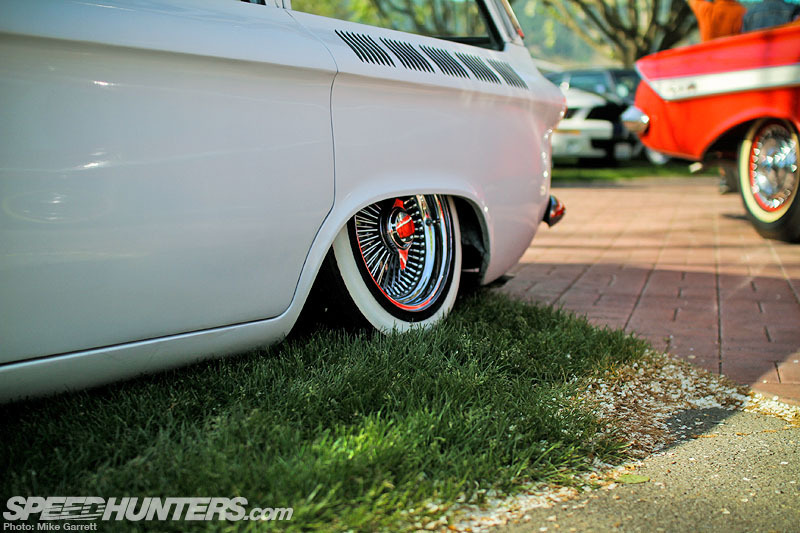 The Chevy Nova/Chevy II is an extremely common car at shows like this, and it can be very hard to build one that stands out. 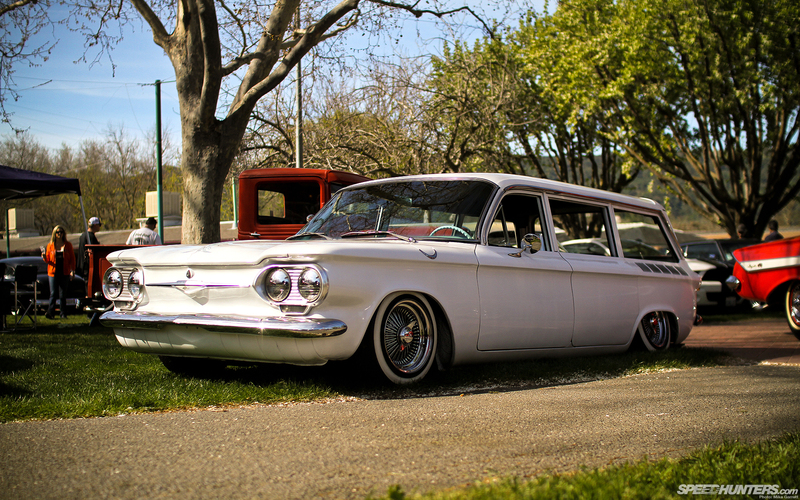 This ’66 from the city of Rocklin has managed to do just that. You might be asking why, because the exterior looks pretty standard. Indeed it does. 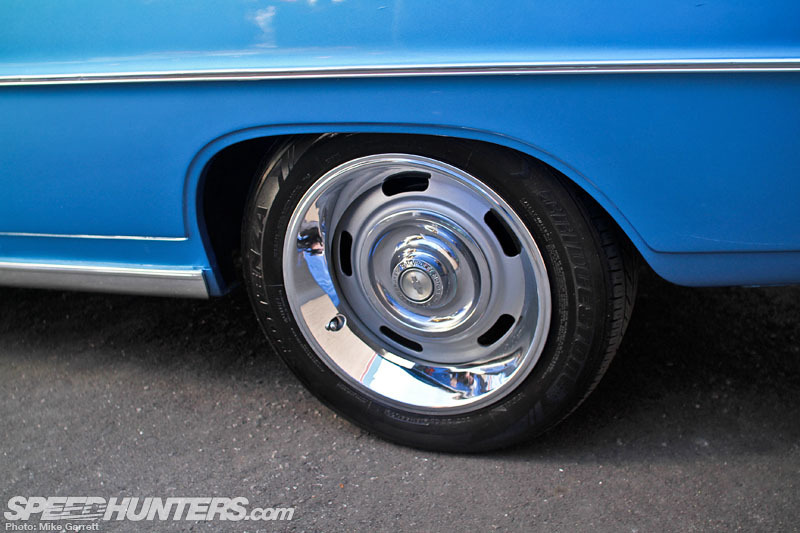 With modestly sized rallye wheels at each corner, it looks like your typical cruise night special. 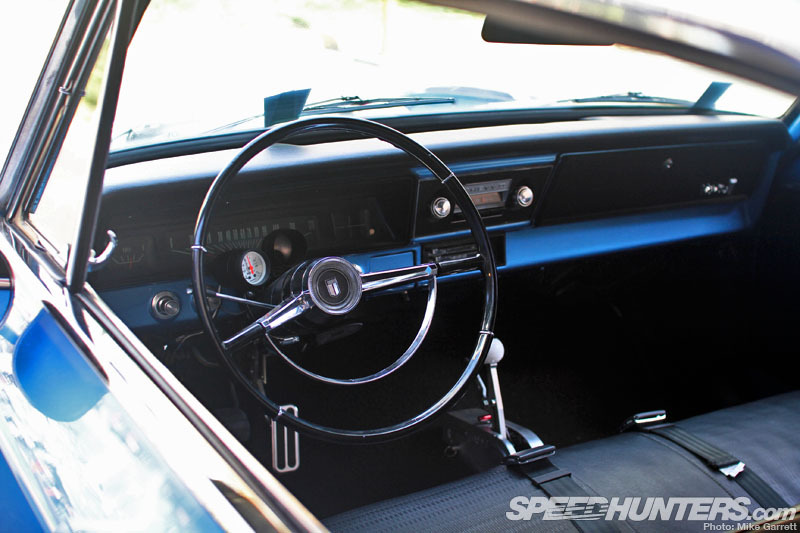 The same goes for the basic looking, bench-seat equipped interior. It’s all very nice and tidy, but nothing out of the ordinary. 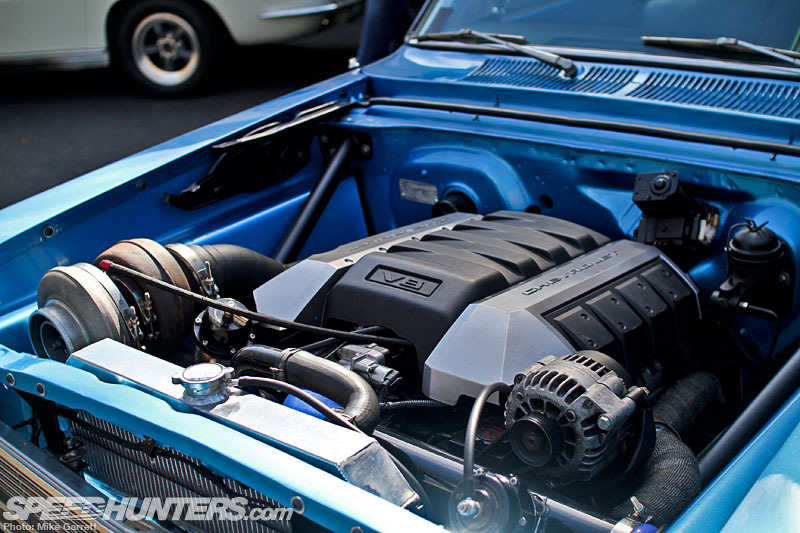 But then you look in the engine bay and see this – a 6.0 liter LSX motor with a massive turbocharger affixed to it. 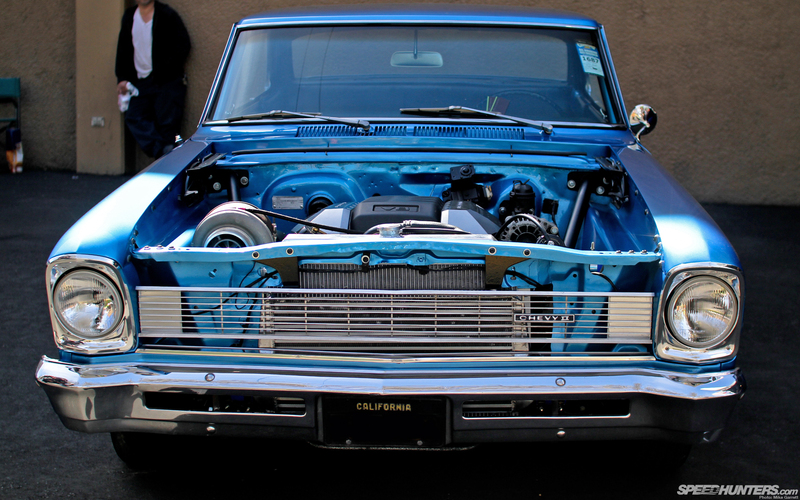 It’s not rare to see old cars with big power LSX swaps and forced induction, but they are usually accompanied by giant wheels and tires, racing seats, and other overt modifications. This one on the other hand is a wrapped in a very unassuming package. One of the coolest sleepers I’ve seen in a while. 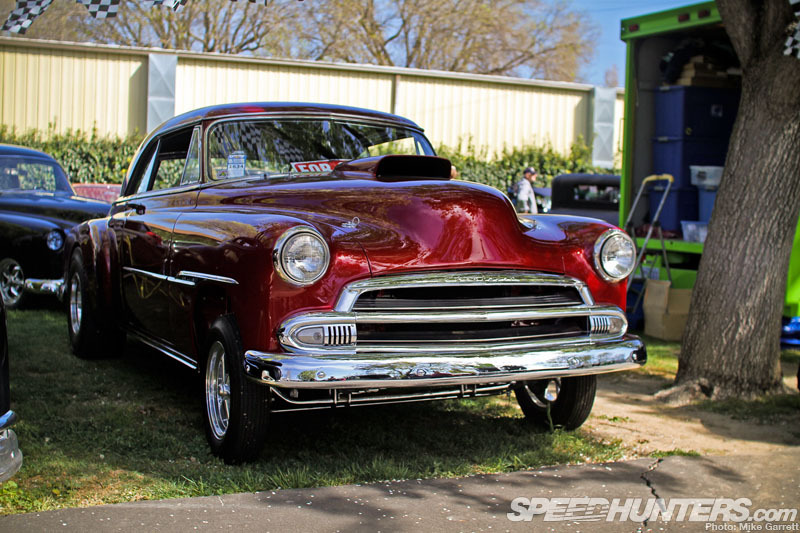 History is one thing that can make a car very cool, and this ’51 Chevy has plenty of that. 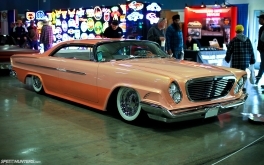 It was originally a mild custom in Southern California and in the early ’60s it was converted into a drag car. 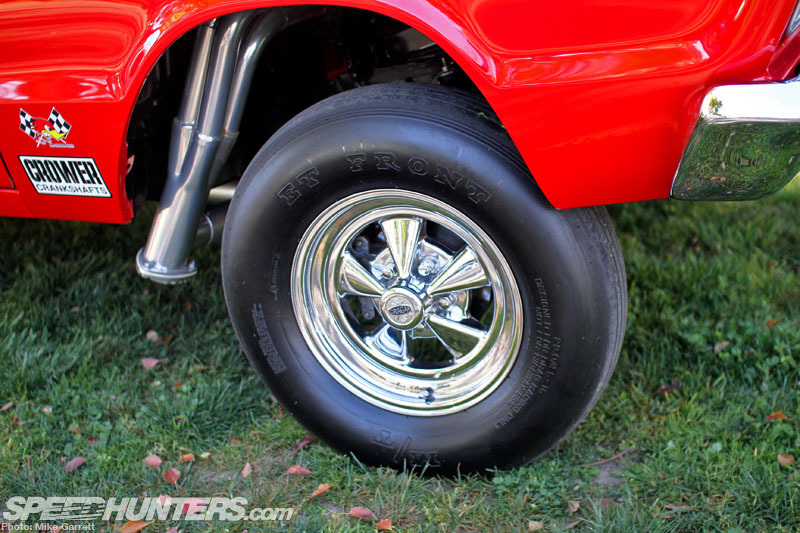 With a straight axle conversion, it ran in gas class competition at places like Irwindale and Lions Drag strip before it was put into storage in 1967. In 2006 it underwent a complete frame-off restoration where modern running gear was added to match its period looks. 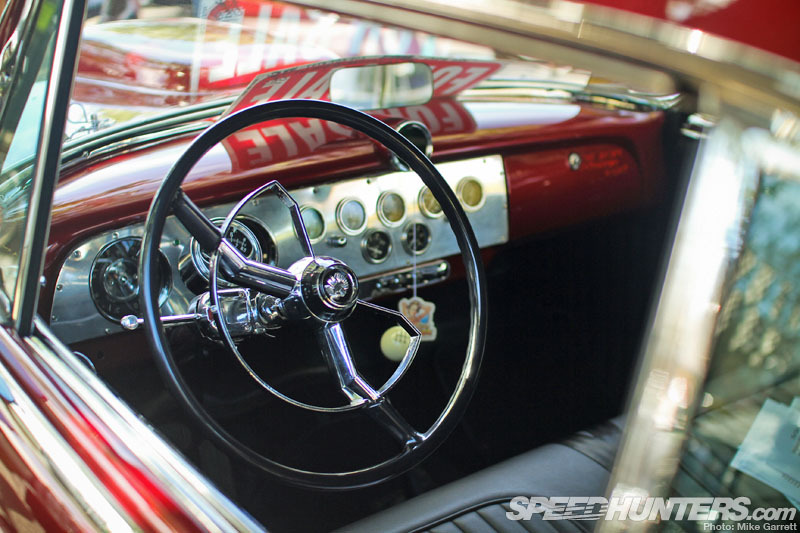 While the interior looks straight out of the ’60s, that shifter is actually mated to a T56 six-speed transmisison. 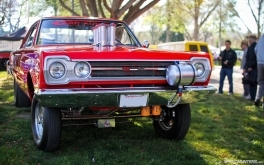 The motor is a 383 stroker with nitrous, making over 600 horsepower on pump gas. 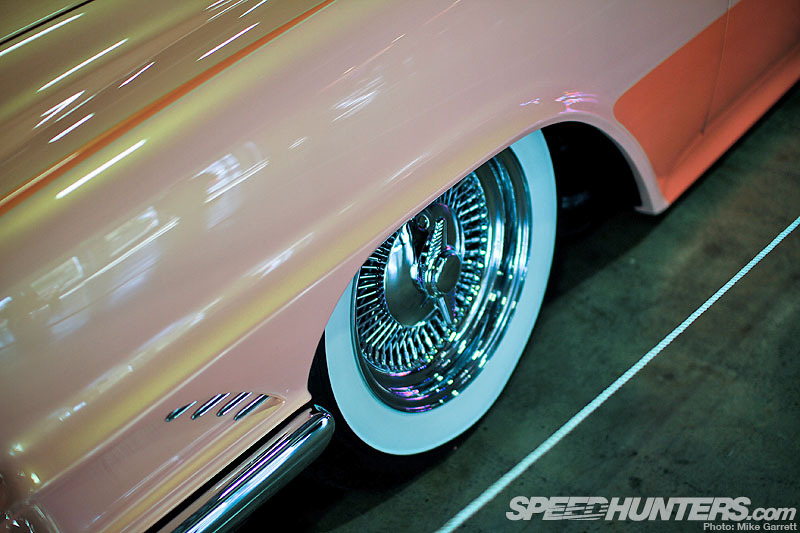 Gotta love the big cheater slicks sitting under fenders that were originally radiused back in the early ’60s. It’s fast, cool, and has a ton of history. What more do you need? 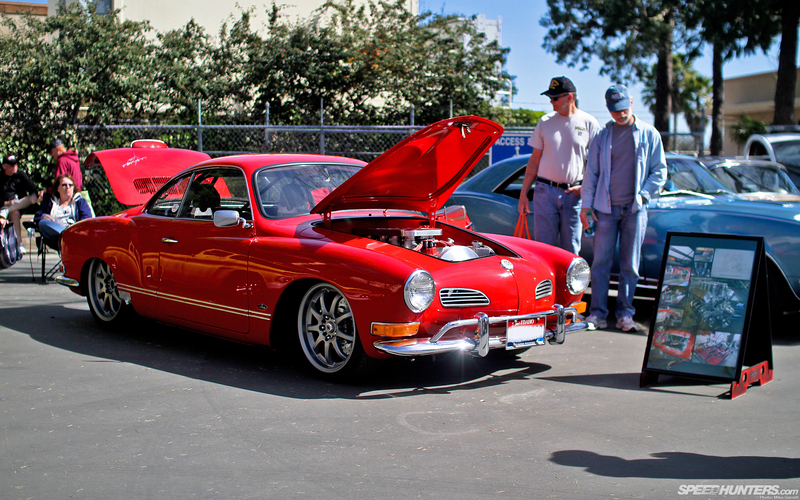 Lastly, we have a rather interesting 1970 Volkswagen Karmann Ghia. Wait a minute. What’s the deal? What’s so American about a VW? 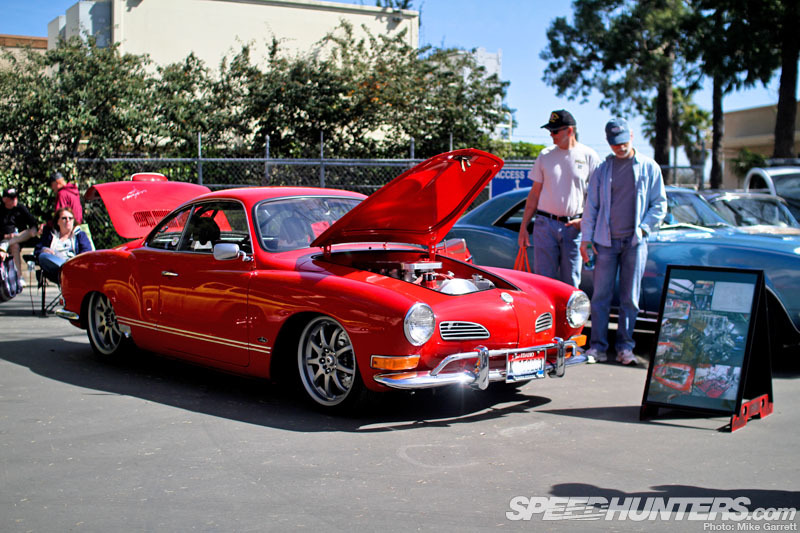 Well, this is no normal Karmann Ghia, but a fairly mental build out of Lewiston, Idaho. 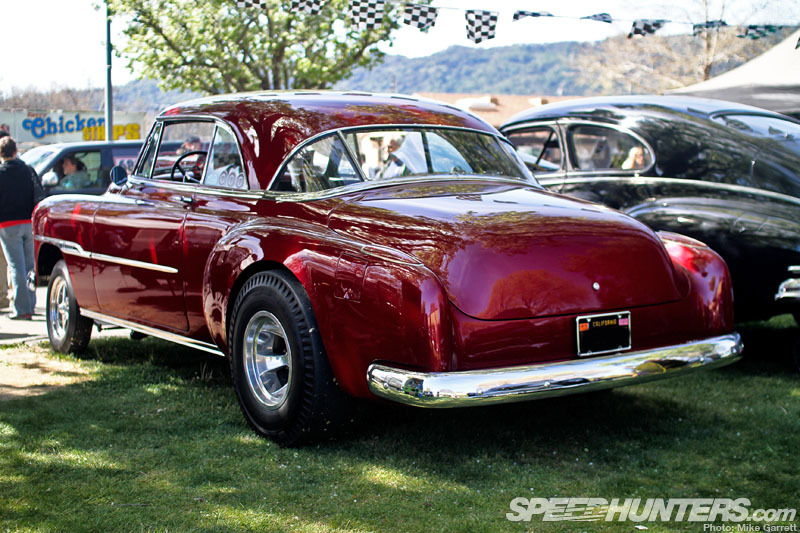 It’s got a custom-fabricated chassis and wasn’t built just for show but for open track events. It’s powered not by an aircooled Volkswagen motor buy by a fully built 331 cubic inch Ford small block that’s somehow been wedged into the front cargo compartment. 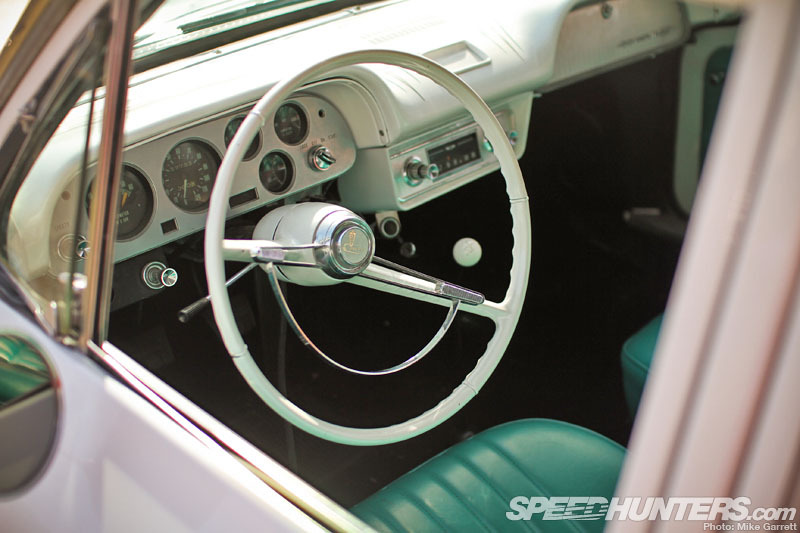 While the Ghia is clean enough to be a show car, a peek inside the interior further reveals its athletic intentions. There are full bucket seats, a custom transmission tunnel and of course a roll bar. 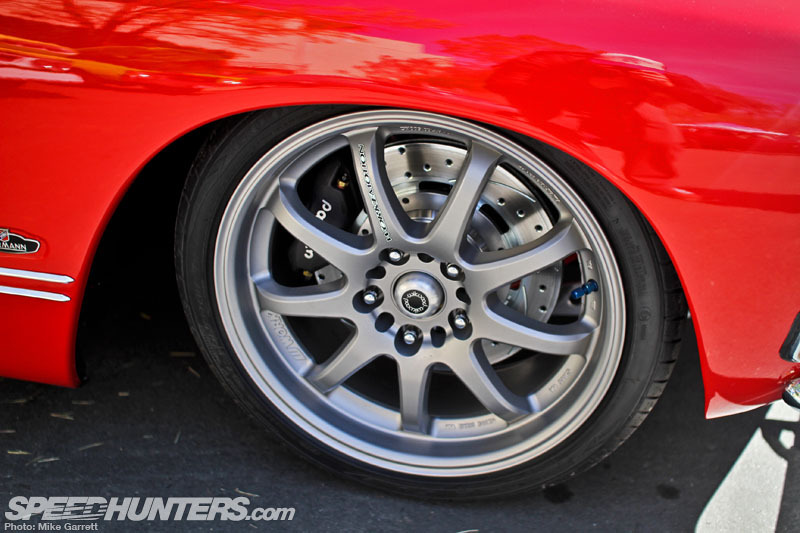 And just to make things that much better, the big Wilwood brakes are covered by a set of Work Emotion XD9 wheels. 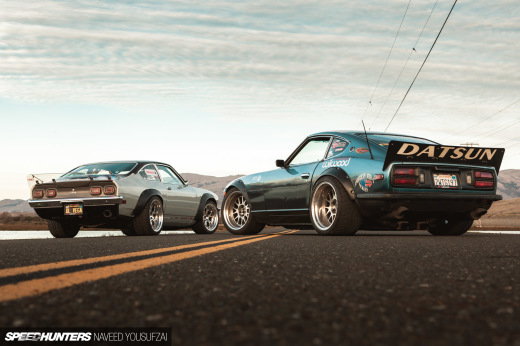 A German car with an American engine and Japanese wheels. Why not? So there you have it. 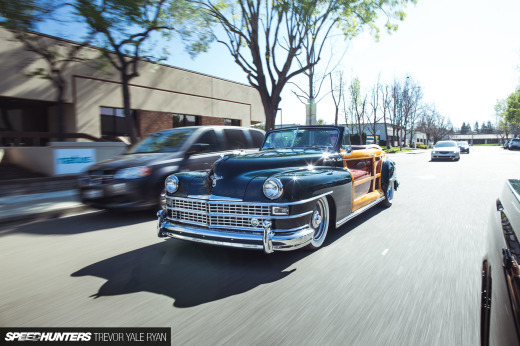 Just a little slice of the automotive extremes from the Goodguys All American Get-Together. I have a few pictures of my '67 Corvair autocross car at http://www.photobucket.com/slrman This car was eventually heavily modified in every area with a Holley 4 bbl carb, special suspension and body mods as wel as a blueprinted engine of nearly three liters (179 CID) In 7 years of autocrossing it never lost to any American muscle car.